Books about the Netherlands during World War II are generally about the Dutch Resistance, but Hilda van Stockum has focused more on the daily experiences of one very close knit, religious family living, but without ignoring Resistance activities. At ten years old, Joris Verhagen can barely remember what life was like before the Nazis invaded Holland in 1940 when he was 4. Life is hard for the Verhagen family - father, a 4th generation millwright, mother, Dirk-Jan, 14, Joris and Trixie, 4, but because they lived in a working windmill, things were not quite as hard as for others in their small village. Now, after four years of Nazi occupation, everyone is hopeful that the Allies will soon arrive. The novel is told as a series of connecting vignettes that show how the family quietly worked hard to resist the Nazis. And so there are some wonderful moments in which their occupiers are outsmarted, like the downed RAF pilot who Joris discovers hiding in an old abandoned windmill and the amusing way that he was he was hidden in plain sight by Joris's Uncle Cor before escaping back to England. Or the two little girls who come to stay with the Verhagens after their parents are forced into hiding and their absolute faith that St. Nickolas will show up at the Verhagen door with Christmas surprises. Even little Trixie has a very surprising story. There are some scary, tense moments as when Leendert, an adolescent, becomes a landwatcher for the Nazis, even though his own parents are against them and threatening to turn his own father in. Always trying to win favor with the Nazis, Leendert like to throw his weight around, like pushing a young girl off a broken-down bike with wooden wheels, causing her to loose consciousness, but not before she manages to toss her satchel into the bushes. Joris later discovers, when he retrieves the bag for her, that it is full of Resistance newspapers. There is so much more that happens to the Verhagen family, and their friends and neighbors, all related with such compassion. But at the heart of everything, is the Winged Watchman. It is the Winged Watchman that ultimately saves the day for so many of them. The two main characters, besides the windmill, are Joris and brother Dirk-Jan, who are portrayed as quite heroic, but not without a certain amount of fear. And who can blame them, living in an atmosphere of betrayal and danger. The most striking descriptions are of the hunger and homelessness that so many Dutch experienced by the winter of 1944 (known as the Hunger Winter) because the Nazis confiscated more and more of the food grown in Holland for themselves and because so many homes were bombed. 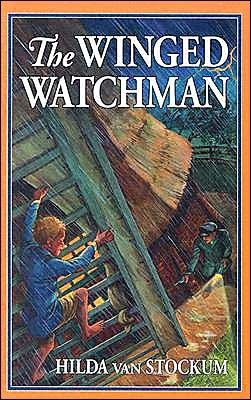 The Winged Watchman was written in 1962 and may feel a little dated and the writing may seem a little stiff to today's young readers, but it is still a compelling story of resistance and courage. The family is deeply religious and van Stockum shows how that also helped the Verhagens preserver throughout. I also learned two intersting facts about windmills in this novel. The Winged Watchman is not a mill used for grinding, but was used for draining the water out of areas below sea level in order the reclaim the land below the water. The reclaimed land is called a polder. The water is diverted to a canal and is kept out of the reclaimed land by a dyke. This kind of windmill, of course, plays an important role in The Winged Watchman, so it helps to understand what it is all about. The other interesting fact I learned is that windmills were used to send coded messages from member of the Dutch Resistance to other members right under the nose of the otherwise ever vigilant Nazis. The messages were read according to the location of the windmills sails, or the different color stripes of cloth tied onto them and sent windmill to windmill. Most Dutch citizens were ferociously patriotic, with only a few traitors like Leendert. though by the time World War II began, she was living in the US, having married an American. She based many of the occurrences in The Winged Watchman on letters and stories of relatives who remained in Holland. 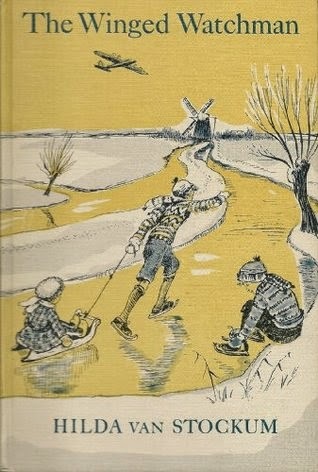 Van Stockum was a prolific writer and in 1935, her short novel A Day on Skates: the Story of a Dutch Picnic was a Newbery Honor book. The Winged Watchman is still in print and can be found in most bookshops and libraries and is still a worthwhile book to read. Thanks for introducing me to books that have been around for a while as well as the more recent ones. I originally found "The Winged Watchman" in a box of old items the Jewish family I was working for was about to toss out. After receiving the book I would read it to my kids at night by the light of our flashlight after the generator was shut down for the evening. It was a great book to read to two small children while snuggling under a blanket together to stay warm. Great and fond memories.